Paradise Palms is a 5 bedroom 5 bath Luxury Villa with attached or ensuite baths for 4 of the Suites. It is luxuriously appointed with 42 inch flatscreen tvs in all bedrooms and 36 inch 3D Tv in the main living room. There is a 15 X 30 foot pool. The Villa is in the Reunion resort with 7 other pools, tennis, 3 world class gold courses, a Waterpark and Much More. 6 miles from Diseny with EZ freeway access. 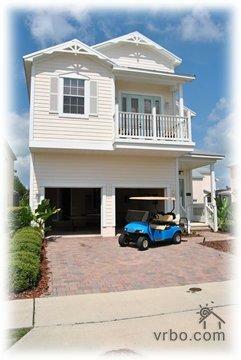 Reunion Resort and Spa is well known for it's facilities and the 3 "World Class" Signature Golf Courses. From the International "Grande Hotel"' with it's famous roof top swimming pool and Restaurant to it's many other swimming pools located around the manicured landscaping Garden Estates and Palm Tree settings. Why not chill out in the evenings at the Grande Hotel 11th floor roof pool area and watch the Disney Fireworks or just watch the Moon in all its glory and the Resort below you stretching out for miles. Located in the area know as Partiots Landing "Paradise Palms" is suitably locted for all the Resorts facilites and the Signature "Legacy Golf Course" disigned by Arnold Palmer. A full Kitchen that can acommodate the making of a snack to a fully prepared and cooked meal - for that special occasion why not have one of our Chefs create a meal in front of you with perhaps "Silver Service" to make it an even more sepecial night to remember. The Villa sleeps 12 with environmentally controlled air condtioning for comfort to all areas. There is a King size bedroom with en-suite bathroom, 2 no. Queen bedroom (one with en-suite bathroom) plus there are 2 no. Twin beded bedrooms. There is also a queen size sofa bed. The private pool and deck area all provide you with an ambiance which will allow you to take the rays without being distrubed by any nearby noise - just relax by the pool and perhapsahve a BBQ and take a drink to go with it - or just look for the wild life in the conservation area while relaxing in the easy chairs. Thinking of a special moment why not have your own masseur come to the Villa and give you a personal and relaxing massage to help you unwind from the day's "rush" of the Parks or Shops. The many acres of landscaped gardens and golf courses are a joy to get around - look and marvel at the different wild life as you take a walk on the hiking paths. Thinking about leaving the car at the Villa - why not get around the Resort by using the completementary Villa's own Golf Cart - the "Blue Dodger" and head for the other area of the resort - the Tennis Courts - the Golf shop or the famous Water Park with its own "lazy river" for all to use. 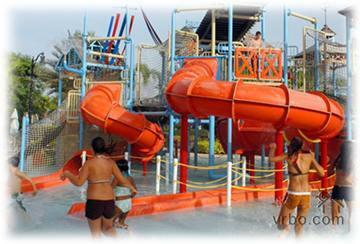 Reunion's famous Water Park - which is the talk of the Vacation World - is enjoyable for both young and old. It has many features that you would expect to see in much larger "Wet Parks" such as Disney's etc. but why travel to these when you have one right on your door step. As part of our Executive offer and through the Membership at Reunion we give access to the Water Park facilities and all 3 Singinture Golf Courses plus all the other facilites. So when comparing our Villa with others please make sure they offer the same Membership advantages of the Water Park access so that when you get to Reunion you do not find out that they do not and then become bitterly disapointed.